Friends of Nepal Association launches its first ever crowdfunding campaign! Education is such an important part of life and is key for the development of children. At FONA, we believe that the future of education in Nepal is worth investing in. We want to invite you to be part of giving children in Nepal the gift of education too. In the earthquakes of April/May 2015 a large number of schools in Nepal were destroyed. Temporary schools have been built from bamboo however this is not a long term solution, new schools need to be built. Friends of Nepal Association (FONA) has a Regional Education Centre Project with the aim of building a model school which will be an educational centre of excellence delivering high quality education for children and adults living in rural districts in Nepal. We believe that the school can be the “hub” of a community and a platform for sustainable transformation, delivering not only infrastructure but also social and economic benefits to the village. We have a team of experts designing the master plan in collaboration with the community. Students, teachers and parents all have a voice in the school design and will be part of the construction. 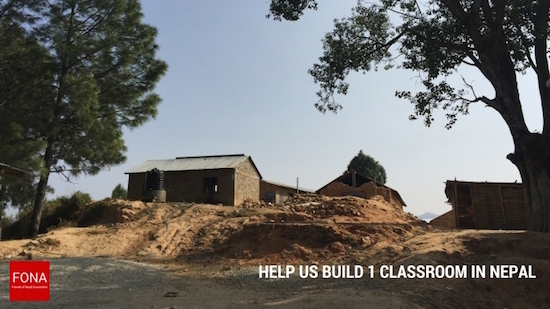 We are crowdfunding to raise $10,000 to build the first classroom in our state-of-the-art education centre. An investment in the school will fund the building of the school, and indirectly provide employment opportunities and income for villagers participating in the project. We would love your help, any contribution large or small, to get these kids back into school AND help a rural community develop sustainably over the long term.